Sift first 4 ingredients, set aside. Measure shortening and honey into large bowl. Beat till light and fluffy, add egg and vanilla, beat well. Mix in bananas, bran, and nuts. Add other dry ingredients, mixing nly till combined. Spread in 9x5x3” loaf pan, bake in 350 oven about 50 mins or until done. Cool 10 mins before removing from pan. Preheat oven to 350 and grease a 9x5x3” bread pan. Cream butter and sugar; add eggs one at a time, beating well after each addition. Sift dry ingredients together (except whole wheat flour), then stir in whole wheat flour. Add to creamed mixture, mixing well. Fold in banana, vanilla and walnuts. Pour mixture into pan, bake 50-60 mins or till cake tester comes out clean – cool in pan 10 min, then in rack. 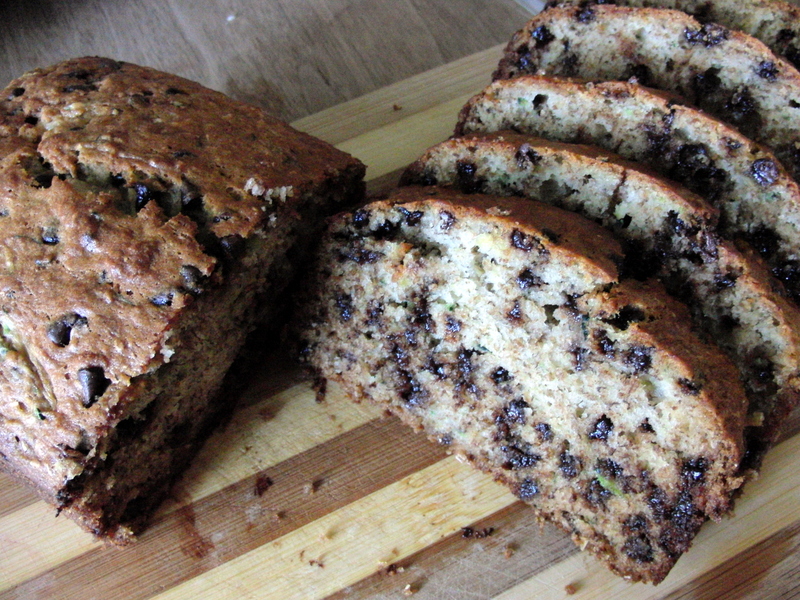 banana bread with modifications. no walnuts; mini chocolate chips + 1 c. zucchini added. delish!